I've been collecting menu ideas for our trip. So far, a frozen lemon mousse: can of evaporated milk whipped with lemon juice and sweetener, chilled over a nut crust. Since this wedding is in an exotic location, I am assuming you are staying at a lovely place. I am beyond amazed that you are packing food to take on an airplane with you. I would bet this will be the first time the bellman carries in food with the wedding attire. Personally, I would stay home if I could not, or would not, go out to eat with other family members. This comment (if posted) will no doubt create a stir, but my mouth is just hanging open at the idea of flying food on vacation with you. Yum! And what a good idea to pack some of your food to take with you! I NEVER would have thought to pack stuff to take on the plane with me! Duh!! Thanks for planting that idea (among hundreds of others) into my head!! Take care. Hey Meredith! My travel agent e-mailed me updated baggage rates in a spreadsheet yesterday and Delta is free for the first bag and $25 per checked bag after that. And if you curb side check it's $3 per bag plus tip. Just fyi. We flew Delta last week and will again tomorrow and we were kinda shocked. We each had two bags to check and it cost us $50. Tomorrow, we will each only check one, which stinks because this trip is longer! There is also a 50 lb limit for a checked bag, so if you're packing canned goods you may want to weigh it first as well. We are staying at my mother-in-law's home, near only one small grocery, and we will be sharing many meals around her kitchen table. In fact, she has specifically requested that I bring several American products that she has trouble getting by boat. Since she does not cook often, I consider it a welcome gesture to pitch in and make a meal or two while we are guests at their home. Taking a few key items I know I can use simplifies things so much for me, as I cannot drive to the grocery on my own. I don't think it's odd to take food with you, esp. if it's in an exotic location. Many moons ago for high school graduation, I went to Cancun with three girlfriends and one girls' parents. We all packed food. Yes, we could buy groceries there, but it was very expensive. I think it's wise to take things with you. Particularly since tourist traps cost so much more. "Vacation" is not justification to go beyond your means. What a great idea. I remember when we lived overseas and I just craved A&W rootbeer. You are so generous and kind. Would love to have you for a guest even if you were doing a little (careful) cooking in my motel. Love the idea of bringing some of your own food. Who wants to grocery shop on a vacation when you could better spend your time visiting with friends and relatives over dinner at your mom's house? I'm gonna try that dessert tonight! MAGNOLIAS! I MISS THE SOUTH and those warm evenings in the SHADE! This pic sums it up nicely and makes mama HOMESICK! You need a magazine!... seriously! I understand the way you think and I have in the past when taking special trips took some items. But you are pregnant and have two little ones and this trip is going to be tiring on you. Or when you return I will have to bring you something to eat. Blessings and Wisdom sent you way. Thank you for posting that quick and delicious-sounding recipe - now I know how to use those extra cans of evaporated milk I have on hand! Macaroni and cheese is light to carry and can become a moderately filling meal for little ones. (I'm thinking backpacking foods...) I hate to suggest salt and preservative laden convenience foods, but I'm sure other meals-in-boxes would also travel well. Oh Meredith, I'm with you all the way! Helping prepare food for your MIL is such a personal way of showing love. And it's much more affordable when it's purchased back home. (This comes from someone who's stashed groceries on top of a beautiful armoire in our deluxe Hawaiian hotel room. ) A little planning leaves a lot more cash for other priorities. I used to be a concierge at a 4-star hotel, so I do know how to act in public : ) But other people might be wondering what is appropriate. If I were traveling to a resort, I would not bring a crockpot and a couple of chickens in the suitcase! Of course, if you are staying in an all-suite hotel, with small kitchenettes, cooking is not only allowed but expected. Having family in an "exotic location", I am well aware of how expensive some items there can be. We still send packages of what many here would consider basic foodstuffs, even with the cost of postage it is still cheaper than buying it there. Our gifts of food were always appreciated, and since the cost here was so much less than what it cost there, it seemed pretty darn smart to bring it with you. I think you are being very considerate and thoughtful, Meredith. My family usually travels to Costa Rica every summer on a mission trip and we always pack food. We pack some of the same stuff you mention, plus my college age brother and sister pack more junk food (pudding packs, cheez whiz, etc.) And I never even go to the grocery store w/ my 3 yo and 2 yo without a snack and waters in the car. I live 20 min. from town and I am pregnant (read: constantly hungry) so I never like to have to spend money on snacks or drive-thrus. Smart to pack that!! "a crockpot and a couple of chickens" in your suitcase - ha, ha, ha! I can just picture that. :-) One of the things that are a quick energy/blood sugar boost is, of course, nuts. Mrs. L.
I always pack food even if I'm going on a U.S. vacation - it's just nice to have it on hand without bothering my host or scouting around for a store. We will all be packing food sooner or later with the way airlines are these days! I fly across the country a lot and even if my flight is 6 hours long they never serve a meal. In fact they are charging $5 for a junk food box! It's almost worse than the movies! 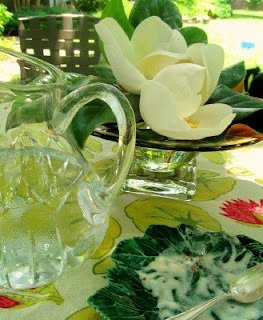 I want to know the story behind your pretty pitcher and bowl that holds the magnolias. i'm sure you didn't pay full price...right? Meredith, really, I am willing to be your "guinea pig" any time. Okay? There is nothing at all unusual about flying food in. People do it all the time. When we visited my sister's family in London, we arrived with several boxes of Jiffy cornbread mix for them. My nieces adore the stuff, and they can't get it there. When my sister's family came here 2 months ago, I requested a specific type of cough drop I can't get here. My parents are bringing tea back for me in a few weeks. This is common. We did it back when I lived in Europe, too. I think it's a great idea to bring some of your own ingredients if you know they'll cost way more there. And bringing American fare to your inlaws is a great treat for them. I really hope you have a great trip! I'm hypoglycemic and I travel with toddlers too. I always stuff as many snacks, and a few staples as I can into the extra space in my luggage. When we travel by train I pack a full cooler for a 2 day trip and we eat what I pack, which is usually tastier and healthier than what we could buy. Not to mention a quarter of the price. Anonymous probably either lives under a mountain of debt or is a lot wealthier than the rest of us to be amazed at such practicality. I hope for her/his sake it is the latter. I'll also bring hard to find spices and condiments to make one of my signature dishes when I'm visiting. I'll even premix them in sealed travel containers to specific proportions so that I can just throw it in with the main ingredient when I get there. eg. Black bean and chili chicken. The sauce is equal parts black bean and chili oil, kecap manis, and soy sauce. Marinate chicken in it and bake or fry and serve with rice. It tastes amazing, is super simple, but could not be done without an Asian food store nearby, or my plan ahead routine. Though you can get the ingredients from Amazon grocery. IF that idea helps at all. Wow Meredith. I don't know how you do it. Flying, pregnant, with small children - and you are packing food too? I think I'd rather stay home that have to do that! I find it a complete hassle to pack clothes for the children (not that we often go away), I think I'd go stark raving mad if I had to think about packing food too. But I do have a few more mouths to feed. And I understand that with a diabetic in the family, food has to be more carefully controlled. I think I paid $3 for the pitcher at Salvation army. We had just married, registered and received a very similar Block crystal pitcher...for $40. I still remember how sick I felt to see another Block pitcher for so cheap. I bought this one and returned the other, using the credit for something more practical. The bowl is hand blown, but it cost only 50-cents at a yard sale in Hillsboro Village. The foot is a little off-center. I've never used it outside before, but I really like the way the sun lights up the glass. I am neither weathly nor under a mountain of debt; rather just a "regular" person who a. didn't realize Meredith would be staying at the children's grandmother's house and b. thought she would be taking more than snacks for little children and a diabetic. I am diabetic and carry little snacks with me and I would also have snacks for small children. I envisioned ingredients for making meals in a fancy hotel. I would be glad to take - or ship (and I would likely have them shipped before I left as shipping probably would be less than paying to check an extra bag and someone else could hassle with it)- special items my MIL could not get but no way would I take cans and bags of things to make meals while I was there. I would be happy to help out in the kitchen, but I would take it for granted that Grandma would have a fully stocked kitchen. After all, she is used to paying local prices for groceries. I think she would insist her pregnant daughter-in-law with 2 small children relax as much as possible and make this somewhat of a vacation. This is from a grandma's perspective! But, the dynamics for every family are different and I just hope everyone has a lovely time! I knew that's what you probably meant ; ) I'm sure I've mentioned we stay with my MIL but I don't feel like I have to give the details of every trip here online for privacy reasons. We each get 2 checked bags and I pack the children's clothes with mine, so checking an extra bag without cost is easier than packing, paying a fortune to mail and then having her go through customs on her end. Here's how I plan to do it: I have a wheeled backpack for these. When we arrive I will put the groceries in her pantry and then collapse the bag to fit in my suitcase on the return trip. So many times we have visited only to see that the boat never came in with Splenda this month, or that pecans sold out at Christmastime. It's truly a matter of my own convenience to have a few key items with me! When we took the Midge to Hawaii (where food is incredibly expensive), I packed half a suitcase of non-perishables for the condo and then we only had to pick up fresh fruit and dairy. It worked out great because we were able to eat breakfast and lunch at the condo (the Midge was still napping then so lunch was followed by a nice long snooze). Then we'd eat dinner out. Saved loads of money that we then put toward our next vacation. oh, yes, anon! Customs! I am in England, and if things are shipped in here there is a risk of customs going through them, and confiscating things. Esp. food. If meredith has the room for it, much better to carry. mom in law being used to the prices is fine for feeding herself, something else again when a pile of family shows up. My mother in law lives alone and if we were going for a multi day visit, we wouldn't think of simply letting her pay for all the groceries. We take stuff, or make a grocery store run and totally ignore the cash she tries to give my husband. Her income is fixed, and while it is enough and then some for such a frugal scottish lady, it's still asking too much for her to stretch her income to cover that many more people! Just don't do what my sister's MIL did once. She packed a frozen brisket in her luggage and then her suitcase got lost for a couple days - nice! My sister's description of the airport agent's face when MIL told him about the brisket and why they better find her luggage SOON is priceless! I'm all for bringing food when traveling. My mom is a flight attendant, and half of her suitcase is snacks and meals! I tried the recipe, Meredith, and I couldn't get the milk to whip up. I ended up buying ice cream instead. Is there a trick to whipping evaporated milk? What did I do wrong? I linked to the original recipe in the text above. You have to chill the can of milk about an hour and then whip for about 5 minutes, or until stiff peaks form. Just like whipped cream, actually. Sorry it didn't work for you!!! I'm making it tonight down here and hope the humidity doesn't jinx me. I have a river of sweat running down my body at this very moment.